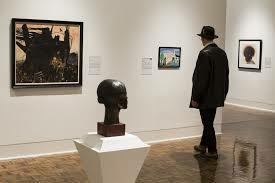 The Muskegon Museum of Art has put together a journey through time and history with their new art exhibit focusing on African American art. The Common Ground exhibit is set up to show how African American artwork has evolved through out history, and includes a community and children’s area so that the public can add to the exhibit. The artwork featured came from the Flint Institute of Arts, the Kalamazoo Institute of Arts and the Muskegon Museum of Art. The exhibit starts out as far back as 1900 with the period known as gaining access, this is a time when the African American artist of that time were creating traditional artwork that didn’t have much inflection into their personal lives. This era changes into the new-self awareness phase, this era happened near the time of the civil war and Lincoln’s abolition of slavery and was a time when more artists were creating work from their own lives and portraying their racial heritage. The civil rights movement had a large impact on the political and social expression age of artwork, which encompassed the Spiral Arts Alliance. Initiated by Romane Bearden and Hale Woodruff the Spiral Arts Alliance was active in political and social representations during the years of 1963- 1965, but also retained the creation of artwork strictly for creative purposes with no connection to the civil rights movement. The Spiral Acts Alliance thought that it was important to keep a healthy balance between political pieces and continuing their artwork for the sake of creation. In the examining identities section Winfred Kembert’s moving piece called Chain Gang is front and center and Kembert himself came and talked to Museum goers on two separate occasions. This section also contains letters to and from Martin Luther King Jr. and Jack Dayand in 1960.